The National Institution for Transforming India also called NITI Aayog has been mandated by the Government of India with the task of preparing a 15 year Vision Document in accordance with the National Development Agenda for the country which will be co-terminus with the 2030 Agenda for Sustainable Development and it's 17 Sustainable Development Goals. The Vision Document will have a 15-year perspective, up to 2030; a 7-year Strategy Paper for the achievement of the Agenda (from 2017-18 to 2023-24) and a 3-year Action Plan beyond March 31, 2017 for the overall development of the country. 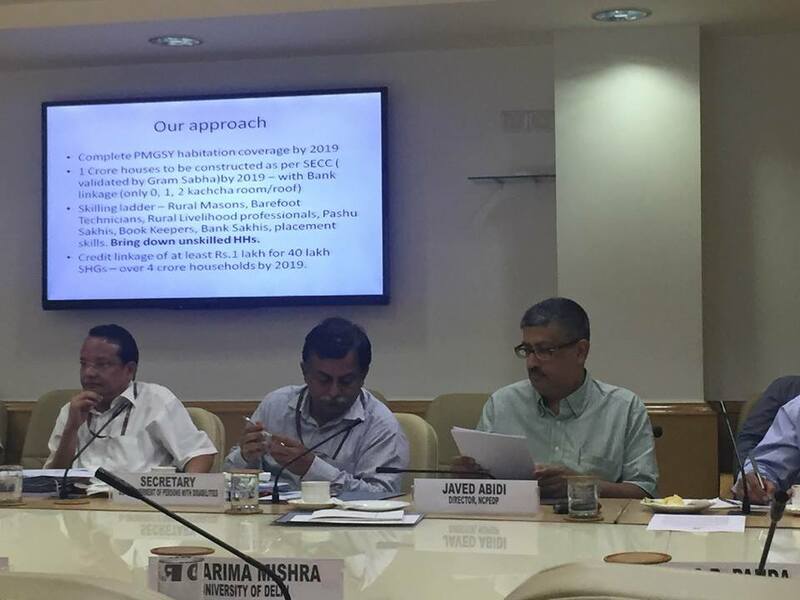 In order to ensure that the concerns of persons with disabilities are specifically addressed in the development agenda and they are not left out yet again, from the development process, NCPEDP has been lobbying with NITI Aayog. As part of our advocacy efforts, Mr. Javed Abidi, Honorary Director, NCPEDP has had several meetings with Mr. Bibek Debroy, Member, NITI Aayog. Also, NCPEDP has constantly kept NITI Aayog in the loop on the various issues being faced by persons with disabilities with respect to accessibility, employment, education, etc. 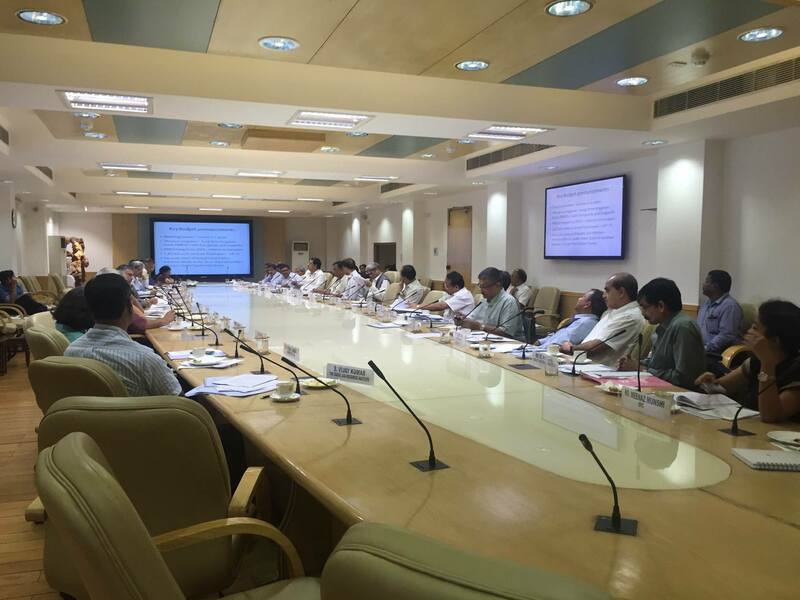 Further, NCPEDP was also invited to participate in the meeting on 'Vision, Strategy and Action Plan on Rural Economy, Safety Nets and Social Inclusion' organised by NITI Aayog in preparation of the Vision 2030 document on 11th August, 2016. NCPEDP made 2 submissions at the time of the meeting asking for disability inclusive development across Departments and Ministries and for the constitution of a disability committee across each of them. Taking the agenda forward, NCPEDP made 'Disability Inclusion across all 17 Sustainable Development Goals' the theme for the International Day of Persons with Disabilities 2016 celebrations. The campaign was launched during the celebrations at India Gate on 3rd December and culminated with a Seminar on the same theme on 9th December, the eve of the Human Rights Day. The daylong Seminar entitled, ‘Disability Inclusion across ALL 17 Sustainable Development Goals', was addressed by dignitaries like Thaawarchand Gehlot, Hon’ble Minister for Social Justice & Empowerment; Yuri Afanasiev, UN Resident Coordinator & UNDP Resident Representative in India; and several high ranking Government officials, civil society and disability sector leaders, and corporate and media representatives. Unanimously, all the speakers and participants at the Seminar emphasized that goals like 'No Poverty', 'No Hunger', 'Good Health', 'Getting Quality Education', 'Gender Equality', 'Good Jobs and Communications', 'Reduced Inequalities', 'Responsible Consumption', 'Peace and Justice', 'Clean Energy' etc. must all be disabled centric as well. After several consultations with stakeholders including eminent economists, business editors, experts in science & technology, agriculture, as well as innovation sector, experts in defence and internal security matters and States and Union Territories, NITI Aayog is now at an advanced stage of finalizing the 15-year Vision Document, the 7-year Strategy Paper and the 3-year Action Agenda. Infact, the Draft of the 3-year Action Agenda has been released (Read here). The NCPEDP Team is going through this document and will soon come out with a response. NCPEDP did a quick review of the initial Draft National Indicator Framework and was shocked to find out that there is hardly any mention of disability! Indicators released by MoSPI provide for disability in only 3 instances. This is substantially lower than even the indicators mapped by the United Nations which had specific mention of disability at 11 places. In each Goal which has a reference or mention of ‘Vulnerable Groups’, disability should be an integral part of the relevant Targets. According to our research and mapping, there are over 200 indicators where data can be disaggregated for people with disabilities. The Indicators must be developed in harmony with the UNCRPD and the RPWD Act, 2016 and wherever possible disability specific indicators must be created. For example, in Goal 11 on Resilient Cities there should be specific indicators on numbers of accessible public places, both private and Government across employment, education, health, recreation, etc. and also, the number of accessible websites providing people with disabilities necessary information and services. Under each Ministry involved in the implementation and tracking of SDGs, there should be a strong focal point that understands, analyses and reports disaggregated data for persons with disabilities. A pivotal role should be played by the Ministry of Social justice & Empowerment, NITI Aayog and MoSPI in ensuring implementation and coordination. To ensure that the estimated 70-100 million disabled citizens of India are not left out of the National Development Agenda for the next 15 years, NCPEDP is lobbying with the nodal agencies mandated with this task - NITI Aayog and MoSPI, to work towards harmonizing the provisions of all frameworks across all demographic constituents who are equally impacted if not more by the same social indices as poverty, health, education, employment, disaster and conflict so as to ensure a development agenda that is disability inclusive and takes into account the diverse needs of persons with various disabilities.